For those of you who aren’t familiar with quinoa, get ready to have your mind blown. This little grain is a staple in my diet for so many reasons. Quinoa (pronounced keen-wah) is considered to be a “whole grain” but it is actually the seed of a plant that is a relative of leafy green vegetables like spinach and Swiss chard. It is an energy-rich food that delivers heaps of fibre and protein but very little fat and no gluten. The protein quinoa supplies is complete protein, meaning that it includes all nine essential amino acids. Quinoa’s amino acid profile well balanced, making it a good choice for vegans concerned about adequate protein intake. And because quinoa is a very good source of manganese as well as a good source of magnesium, iron, copper and phosphorous, this grain may be especially valuable for persons with migraine headaches, diabetes and atherosclerosis. Pretty groovy eh? Now I know what you’re thinking: there is no way this stuff could actually taste good – but I assure you I am total convert from white rice. Cooked quinoa seeds are fluffy and creamy, yet slightly crunchy. They have a delicate, somewhat nutty flavor. The best part about quinoa is its versatility. Because its flavour is so subtle, it can be mixed with sweet things like fruit for breakfast, or savory foods for lunch and dinner. You can even find pasta made out of quinoa – about 1000 times better for you than the white stuff! While the most popular type of quinoa is a transparent yellow color, other varieties feature colors such as orange, pink, red, purple or black. You can find quinoa at most health / natural food stores in prepackaged containers as well as bulk bins. Some supermarkets are now selling it, but I’ve noticed it’s rather expensive. I prefer to buy it in bulk because it’s much cheaper and because I go through it so quickly! Wherever you buy it, make sure there is no evidence of moisture – it should be very dry. First, it is important to rinse the grain; skipping this step will make the quinoa taste bitter. I like to measure the desired amount in a large measuring cup, fill the rest with water and swish it around, rubbing the seeds together. Then strain out the water and repeat until the water runs clear, usually 2-3 times. 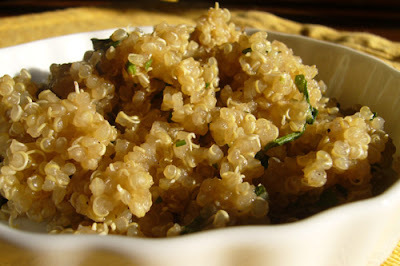 To cook the quinoa, add one part of the grain to two parts liquid in a saucepan. I add a dash of good quality sea salt if I know I will be using for a savory dish. After the mixture is brought to a boil, reduce the heat to simmer and cover. One cup of quinoa cooked in this method usually takes 15 minutes to prepare. When cooking is complete, you will notice that the grains have become translucent, and the white germ has partially detached itself, appearing like a white-spiraled tail. For a change, try using quinoa instead of rice as a bed for stir-fry’s and stews, or add it to your favorite soups. Like I mentioned above, quinoa is a great breakfast food. I sometimes combine it with apples and pumpkin seeds, or mash up a very ripe banana and mix it in the quinoa with unsweetened coconut flakes and raw cashews. YUM! Quinoa is also great cold – combine cooked, chilled quinoa with pinto beans, pumpkin seeds, scallions and coriander. Season to taste and enjoy this south-of-the-border inspired salad. So if you’re not convinced after my very long testimonial, just go out and get some. Quinoa is so delicious, easy to make, versatile and of course, a totally healthy super-food! And you shouldn’t accept anything else from the food you put in that beautiful body of yours…here’s to quinoa, your new best friend. I mixed quinoa with roasted summer squash (the kind with scalloped edges) and red onions (rolled in a little olive oil and salt/pepper), then swirled in some of your mint chutney recipe — it was delicious! What a pleasure to have found your blog through a friend 🙂 I have only recently decided to pursue my interest in becoming a nutritionist so this is a really fun sight to be exploring. My question for you about quinoa, which my whole family really likes, is how do you feel about cooking up a batch for the week? The convenience factor is alluring, but I have read in different places that food sitting in fridge can grow mold or other things. I’m also a big fan. Has anyone ever found granulated white pieces in the Quinoa? One of my co-workers recently bought some and said it was crunch city, to the point it hurt her teeth. I have experience these little granulated pieces but not very often and I never saw it as a problem. Has anyone else had this experience? or know what it is? is there such a thing as eating too much quinoa? or is it the best option for every meal? quinoa, huh? mr. migraine knocks on my head all too often, this just might get rid of him. thanks! I agree, Quinoa is delicious!! It may be hard to pronounce, but it’s even harder to pass up!